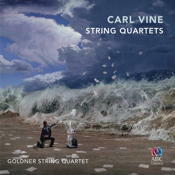 Carl Vine's music for string quartet spans nearly three decades, so acts as an album of snapshots that document the development of his musical language. His earliest mature works date from the 1970s, when he first came to prominence as a composer for dance, particularly in collaboration with Graeme Murphy and the Sydney Dance Company on works such as the legendary 1978 tribute to Jean Cocteau, Poppy. The five works on this recording range from Vine's first quartet, Knips Suite, composed and premiered (by the Arditti Quartet) in 1979, through to his fifth, composed and first performed (by the Goldner String Quartet) in 2007. This is the first commercial recording of those two works, as well as of the second quartet (1984).